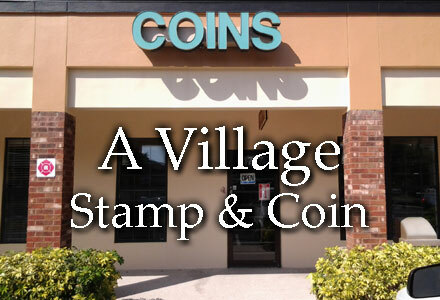 Sell coin collections and old paper money at A Village Stamp & Coin, serving Florida and the Tampa Bay Area since 1979. We provide 150 years combined experience in rare coins, numismatics and coin collection appraisal. We are established dealers in gold and silver coins, certified coins and old currency, and provide appraisals for rare coins and stamps. For your convenience, a full inventory of coin and stamp supplies is available in the store. Bring your coin collection or rare coins to our shop for an expert appraisal and immediate payment. We buy and sell gold and silver coins, bullion, bars, rare coins, copper, platinum, palladium, old currency both U.S. and foreign, rare stamps and certified coins for hobby and investment. Sell Your Coins - Bring your coin collection or rare coins to our shop for an estimate of their value. We have a reputation for offering a fair price to buy your coins. Old Paper Money - Buy and sell old paper money and currency both U.S. and foreign. Rare and investment currency. Gold and Silver - Buy and sell gold and silver coins, bars, and collectibles. Rare and investment coins. Certified Coins - slabbed and graded coins for investment and numismatic value. Appraisals - Find out what your rare coin or coin collection is worth. About Us - We are rare, gold and silver coin dealers in Tampa FL. With over 130 years of combined experience, A Village Stamp & Coin provides the expertise you require to make the right decision with your investment. Items of Interest - Rare and hard-to-find items that we have seen come through our shop. Some are still in stock and can be purchased today. Prices quoted in this video are subject to change according to market conditions. At the time of filming, the spot price of silver was $18.75 an ounce. A video about the difference between common, scarce and rare coins from the coin experts at A Village Stamp & Coin, Tampa's most trusted coin store.